Cancer treatment-Top 6 Life hacks! ….So, you or someone you care about has been diagnosed with Cancer….now what? Remember how you made all those plans on January 1 to get organized? This time, it’s real. Successful treatment means being your own best advocate. It means getting the best information and the best treatment you can possibly get. This is not the time to be a shrinking Violet,afraid to offend-you must speak up. Your survival may depend on it! Cancer: 50 essential things to do Cancer 50 Essential Things by Greg Anderson. Practical and important advice for the newly diagnosed and those recurring. Get your major appointments, scans, chemotherapy treatments, radiation treatments, and tests written down in one location. You may need it in a year from now or two, or three, or 10! I like a three year calendar or even a five year calendar, because I plan to be around a long time! Miles Kimball Three Year Calendar or go big and get a five year calendar! This is only for big ticket items…not daily symptoms or questions. Dream big! You plan to be around for a long time! -Find those motivational quotes that keep you going! 4. The American Red Cross gave me an accordion folder that I keep paper test results and informative literature and paper copies of articles on the forefront of cancer research. I used to print off articles and ask my doctor about them at appointments. 5. EVERY time you see your doctor, ask for a copy of your lab results. Every single time! 6. Don’t be afraid to ask for a second opinion! Doctors expect it. This is your life!! Take ownership of your treatment. Shed that reticence to be “that” patient. Ask for information from your doctor on why he/she wants to do specific tests and what he/she hopes to learn. Your strength comes from your willingness to speak up!! This may be your only chance. This is not a polite dinner party, but it is your very existence! This month is Breast Cancer Awareness and last month was Ovarian Cancer Awareness! Please share this valuable information with your friends and family. Someone might be waiting for this article right now! I recently spoke with a Mid-Pacific graduate, Matt Hoe*, whose father passed away in 2014 of colon cancer. I admired his courage as he fought through the grief of his father’s passing and turned that pain into an award-winning film. His words about cancer, which I first heard at a chapel assembly, were penetrating: “If I were to give you one piece of advice, it would be to learn that abstaining from saying that the sky is grey does not make the clouds go away. It just means that you don’t get to talk about the sky.” Matt’s words resonated long after I heard them. Each month I go to an Ovarian Cancer Support group meeting where women from all over Oahu come to share their stories of surviving and fighting cancer. Many of the women are many years removed from their initial cancer fight and some are still in the thick of it. Some are bald, some wear wigs, some have scraggly fine hair (that would be me) and some have pretty luscious locks. Each month we have newcomers struggling on that shifting sand of a new cancer diagnosis. Cancer is relentless, and there is always a ready supply of new patients. We don’t have all the answers for each other, but we share our stories in hopes that our own personal experiences and treatment will give hope to each other. For me, it’s comforting to know that many are living fully having successfully navigated this beast. 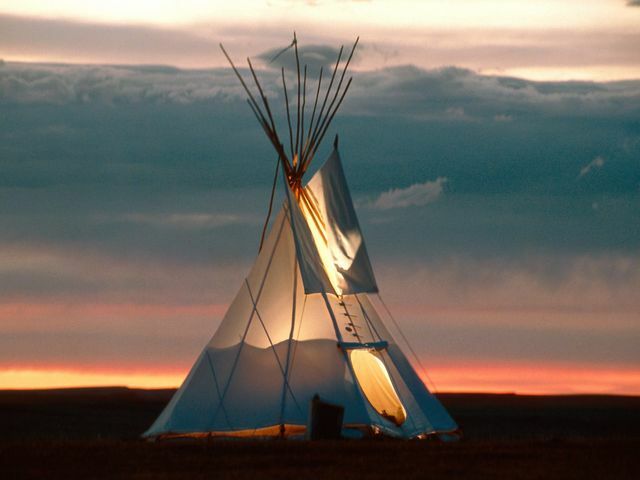 We are like a big teepee-each of us is a stick that props up the total structure. It’s our collective nature that makes us powerful. Recently, there was an audible gasp when one of the women shared that she was entering palliative care (palliative care is primarily focused on providing pain relief rather than searching for a cure). She spoke of her situation matter-of-factly and at the time, I wished I could hug her pain away. Being among this group of loving and supporting women can’t cure the pain (or the disease), but it eases the burden of having to carry grim information all alone. We are also there for each other’s joys and triumphs! How many times have you thought about someone who is fighting a major health issue (whether cancer of something else) and were afraid to reach out for saying the wrong thing? Saying nothing is equivalent to doing nothing. Knowing that others are there to support you is a type of palliative care in itself. 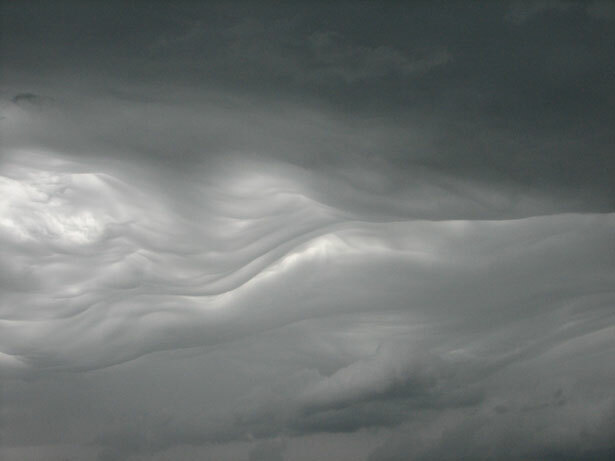 Matt continued, “For those of you who feel a storm brewing, I tell you this: learn to talk about the sky, and those crinked clouds of emotion that so often choke your voice. Feel the rain on your skin. I know that it’s scary to be vulnerable. But trust me, It’s scarier to be alone when it starts to storm.” Will you be successful when you reach out to those who are suffering? Maybe or maybe not. 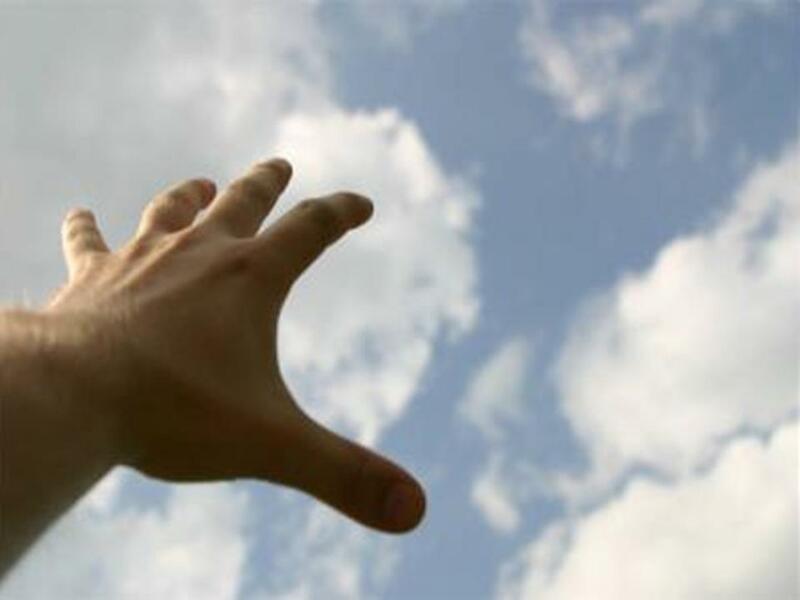 It’s the reaching out to each other than connects us all together. Take the time to reach out to your friends who are facing grey skies–do it now! One of my students showed up to summer school class every day with large over-the-ear headphones listening to this song by Skrillex and The Doors-Breakn’ a Sweat (a largely repetitive, but somehow catchy electro/dub step song-you probably will not like). 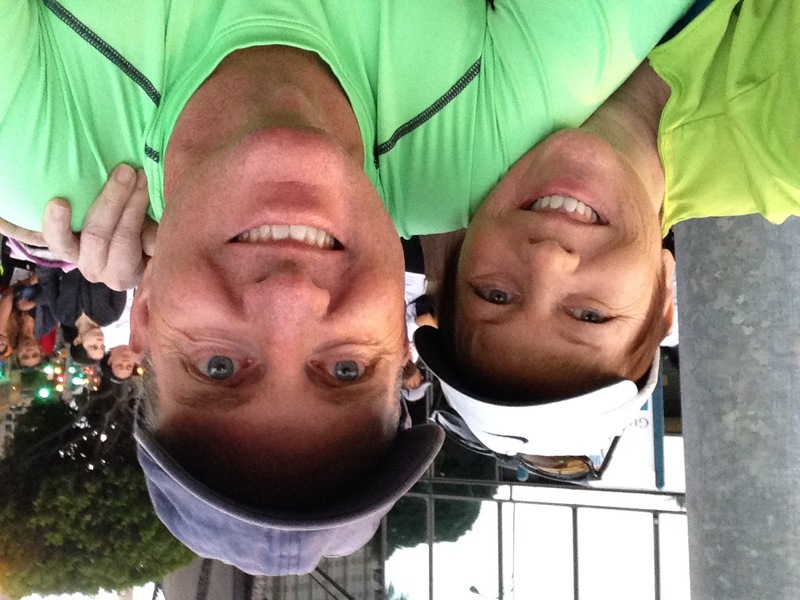 But, this song was in my head as I trained for the Great Aloha Run of 2015. 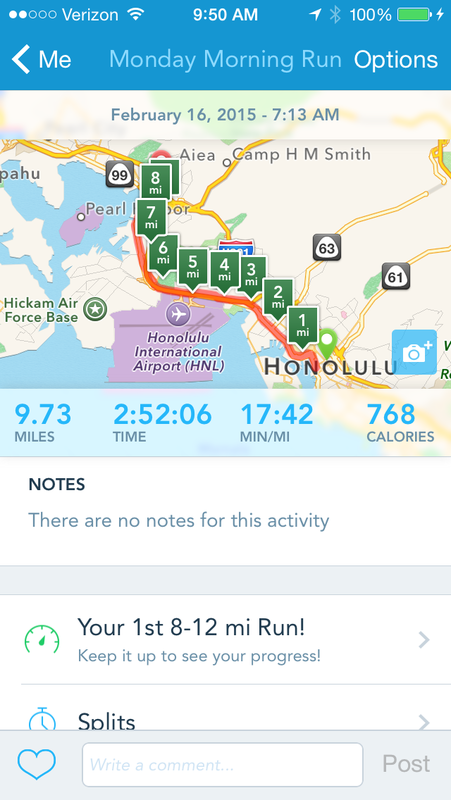 I wasn’t even sure I could do the 8.15 mile Great Aloha Run (and just to clarify, I am talking about walking it, not running). My friend said multiple times, “you can always back out if you are not up to it.” My plan was to just get up and get out there and see what happened. Up until Monday (race day), the longest training “run” was a 1.5 mile walk. In keeping with my 2015 goal of becoming STRONG I felt like it was important to at least get myself out of bed and get down there and try. My January training was stymied by a mega migraine that put me back several days (See Professional Vomit Queen). We woke up extra early to make our way to the Starting Line. I stood on the corner watching the sun come up with my little team of two (Debbie and Ross). 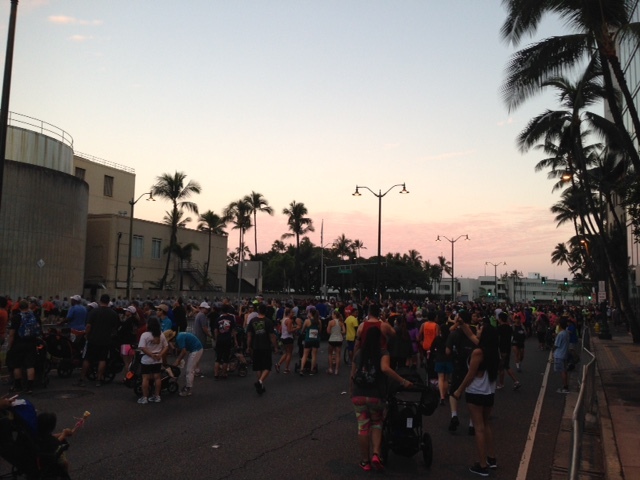 We stationed ourselves at the back of the pack along with the wheelchair participants and stroller moms and watched the sunrise reflected over Aloha Tower. 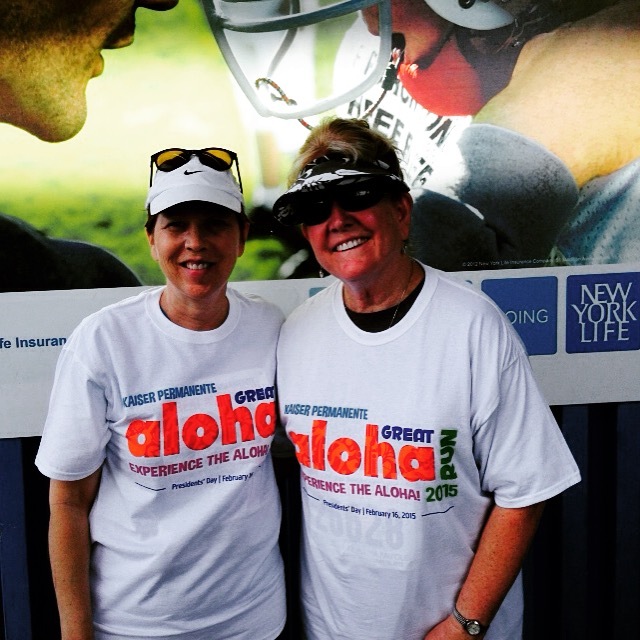 Great Aloha Run-sun rising above the starting line. 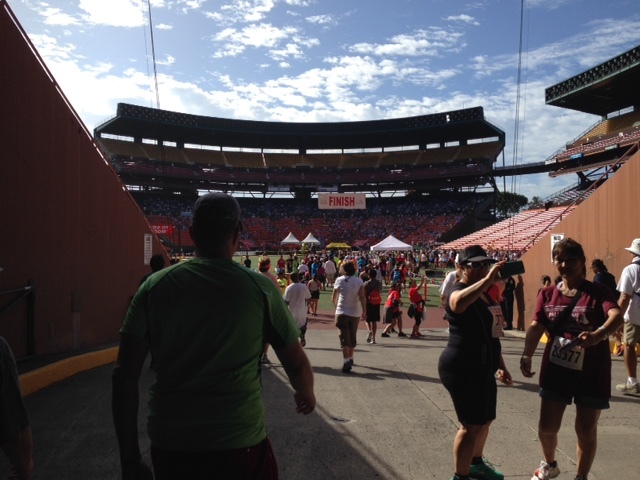 Twenty thousand people had the same idea I did and were out there for the Great Aloha Run! Interesting side note is that many more were registered and just didn’t show up. I am sure they had many good reasons, but come “game day” it didn’t happen. This is what the front of the line looked like (or so the newspaper told me). Despite a bad knee (Debbie), a bad calf (Ross) and sore hips (me), we finished! 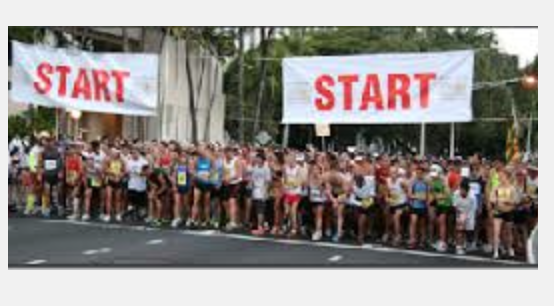 At one point, I jokingly said, we should do the Honolulu Marathon in December. This idea was introduced around mile 7, so the enthusiasm for it wasn’t as high as I had hoped. We completed the race in 2 hours and 25 minutes. Plus, when you add the time and distance to get to and from the start and finish line…we totaled 9.73 miles! Dynamic Duo in our fancy new “finisher” T-shirts! When my own children used to agonize over writing essays for English class, I used to tell them…It doesn’t have to be perfect, it just has to be done. Words on paper are better than no words at all. That is how I felt about this race. We could have been a lot faster and trained a lot more, but we still got out there and did it. Plus, we were together, which made it all the more fun! What’s my current situation? Still plugging away at maintenance chemo every three weeks. I had treatment yesterday and slept 12 hours straight in recovery last night. Still teaching! Still doing!